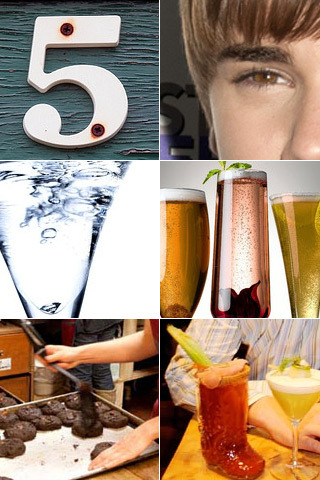 Bieber, chocolate, diamonds and champagne… these are a few of our favorite things. OK yes Madtini readers, I may be stretching it a bit on the whole Bieber thing. But as proud Canadians here at Madtini, we so swell-up a bit with National pride at every TMZ or ET mention of our cutest export. And now, suppressing our schoolgirl squeals, here’s our weekly collection of 5 Essential Drink Links you may have missed this week. Just in time for Grammy night, Nate Wiger, resident mixologist at Hollywood hotspot Drai’s has come up with the Biebertini, a virgin cocktail inspired by Canadian pop star Justin Bieber. The $22,ooo Cocktail. Now that’s a garnish! If you’re into splurging on that special someone this Valentine’s Day, the Ritz-Carlton Tokyo has the ultimate splurge, the US $22,000 Ritz Diamond Martini, complete with a one-carat diamond. Oh, it also has Grey Goose vodka with a hint of lime. The Wall Street Journal has a list of 3 classic (yet simple-to-prepare) champagne cocktails you can throw together to impress your loved one. Whether you’re looking for a special chocolate treat for that special someone on Valentine’s Day or just something to enjoy on your own on a Saturday night, BlogTO has a list of the best destinations for Toronto Chocoholics. To celebrate the anniversary of the Games, Yew Restaurant + Bar in the Four Seasons Hotel is showcasing the three signature cocktails that bartender Justin Taylor and his team produced during the Vancouver Olympics. Each cocktail represents a Canadian city that has hosted the games.